Bulk operations enable Power BI admins to perform repetitive tasks efficiently. Perhaps you need to add a new hire as a workspace administrator to all workspaces of the Finance department. Or maybe you need to restore multiple deleted workspaces or recover a few orphaned ones. It is also imaginable that you needed to enforce a more restrictive “Publish to Web” policy across your organization and now you must delete hundreds of infringing embed codes. The good news is that recent improvements to the admin portal let you perform these tasks in a single operation. You no longer need to resort to PowerShell scripts. Let’s take a closer look at the bulk operations for workspaces. The following screenshot shows a list of workspaces in a test tenant filtered by Type = Workspace and State = Active and On dedicated capacity = False. If you select a single workspace, you can display details, manage access permissions, and change the workspace title and description according to the commands available in the common command bar at the top of the workspace list. If you select multiple workspaces, only the commands supported across all selected items remain available. 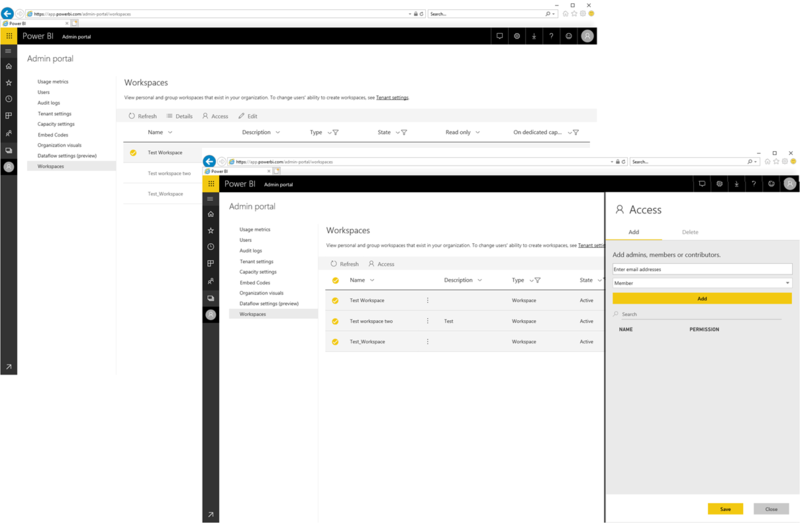 In the screenshot below, this is the Access command, which let’s you add or delete admins, members or contributors from the selected workspaces in a single step. Similarly, if you changed the filter to Type = Workspace and State = Orphaned, you can see all the workspaces that no longer have any user with administrator permissions. 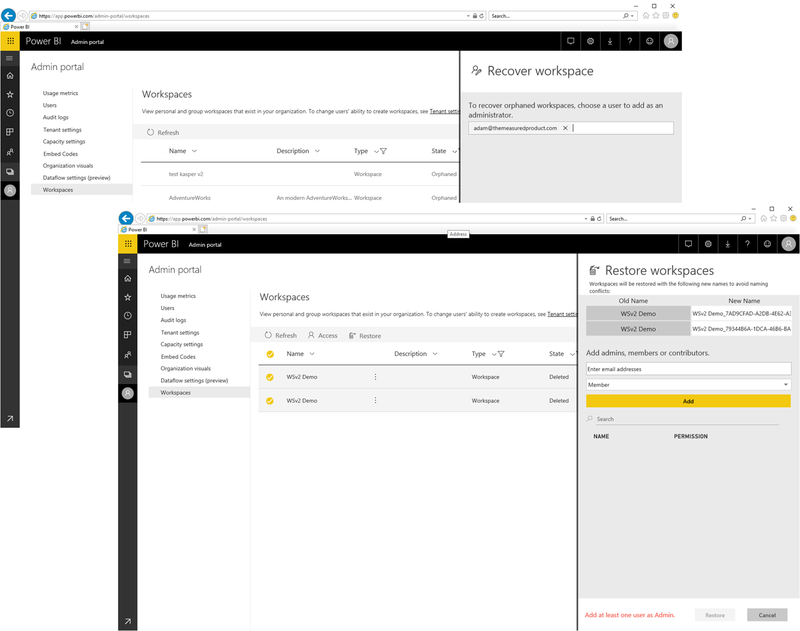 For orphaned workspaces, you can use the Recover command to add a user account as an administrator thus bringing the workspaces back into active state. By the same token, you can use the filter Type = Workspace and State = Deleted, and then use the Restore command to undelete all these workspaces. Note that each workspace must have a unique name in Power BI. If a user deleted a workspace and then created a new one with the same name, you must assign a new name to the deleted workspace to recover it. Also, you must add at least one user as an administrator. As mentioned, bulk commands are only available if all selected items support them. Legacy workspaces of type Group or PersonalGroup do not support editing of access permissions, recovery operations, or restore operations, so the Access, Recover, and Restore commands would be unavailable if a Group or PersonalGroup-based workspace is among the selected workspaces. The filter Type = Workspace ensures that only modern workspaces are displayed. Another limitation worth mentioning is that bulk operations work within the scope of the currently visible items. With a maximum page size of 100 rows, you can update a maximum of 100 workspaces at a time. For example, if you wanted to add a user to 500 workspaces, you must perform the operation five times or revert to PowerShell scripts to loop through all 500 workspaces in a single run. And that’s it for a first round of bulk operations enabled in the admin portal. Subsequent improvements are going to add further capabilities, so stay tuned for more announcements and please take the new capabilities for a test drive. As always, let us know of any additional requirements you might have through the usual Power BI community channels or as comments to this article below.